2010 began with a bang during the Countdown event at Marina Bay with a quarter million revellers, yours truly included, ushering the New Year watching the eight minutes worth of fireworks display. 20 hours into the dawn of the New Year at the same vicinity, The Esplanade Theatres by the Bay to be more precise, two regional artistes that need no further introductions were on hand to stamp their mark and affirmed their par excellence statures to the eagerly-anticipating audience. It also meant, I were to begin 2010 with something substantial to fill this blog which was in danger of going into oblivion towards the end of last year. Rumours of this concert had been bandied around sometime in September 2009 but was only let slipped and confirmed by Dato’ Siti Nurhaliza in an off-the-record conversation with a journalist in October. The journalist was only too pleased to share this piece of good news to the readers and from then on, it was a case of waiting when the announcement was to be made official. A month on, I was alerted by the email alert by Esplanade that the show would be on New Year’s Day itself, an excellent start to 2010 for any decent music lover who appreciates the talents at disposal. Due to overlooking my inbox, I only managed to purchase the tickets three days after they had started selling it. Which meant, I missed out on my customary front row seating. However, I was told that the first two rows were blocked for media and sponsors. I had to settle for Row 13, which was a major concern, as I was open to being approached by the ushers to put away my camera, seeing how strict they are with the photo-taking. I tried to apply for media passes, a special dispensation perhaps, but I was told that it wasn’t possible. 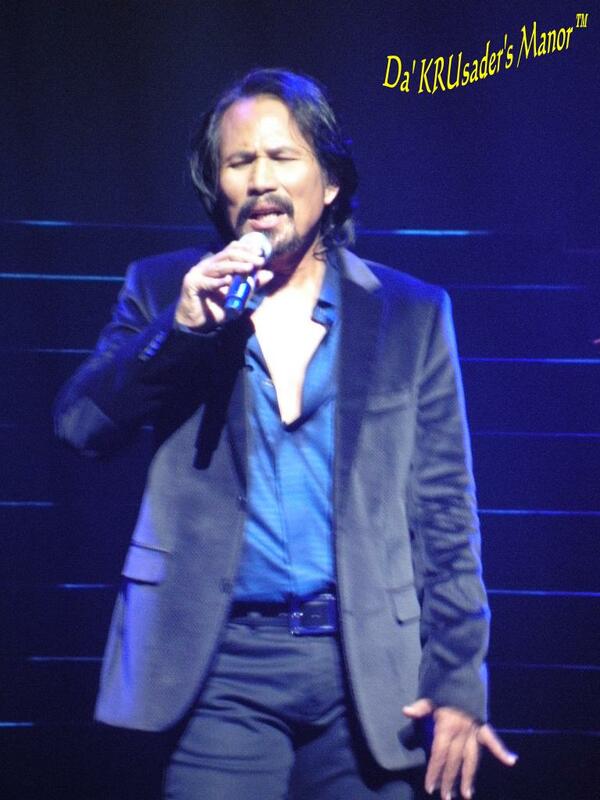 So I clung to the hope that I could do the same technique I did during Anuar Zain‘s concert back in 2008. What technique I did, well it’s up to you to let your imaginations run wild. It also helped however, that it was a live televised event, so the ushers were not busy moving around to stop people from taking photographs or recording clips. I only collected my tickets right before the show, which meant I only knew the exact hall to go to once I had them in hand. When I booked the tickets, I did not go through the online method but I called Sistic straightaway to ask for the nearest possible seat to the stage. I had assumed that with two of the biggest names in the regional Malay music industry, they would have held it at the Concert Hall, which would attract more people to attend. As it is, when I found out that it was to be held at the Theatre Hall instead, I thought that the two performing artistes deserved more fans to watch them. On the flip side of it, a slightly smaller venue would make the setting more intimate and of course adding to the exclusivity of it all. What was special about this concert was the fact that the two legendary artistes were paired for the first time in a concert. Yes you’ve heard it right, they have never staged a concert together nor performed their duet “Bagaikan Sakti” live before this. Or so I was told. Which was a bit strange in my opinion, seeing how the song was the essence to the hit movie “Puteri Gunung Ledang“. But there is a time for history-making to be made. 1st January 2010 would be a date to be remembered, not only to the witnessing audience in the arena, but to the millions watching at home live via Astro. And for that, we have to thank Amin Hussen, the head honcho of Beyond Events, and his team for putting together this landmark event. Even before we entered the arena, I could feel the anticipation in the air, that feel-good aura emanating from the watching audience who were eagerly making their way inside. Meeting Anugerah 2005 winner Hyrul Anuar along the way in, he shared that he was so excited about the concert, a feeling he felt as though he was the one who was slated to perform. Being the massive fan of Dato’ Siti Nurhaliza that he is, I could relate to his excitement as years ago, I too was in the same shoes as him, before marriage and family diminishing those feelings. I have to admit that I’m less of a fan now, not following her progress as much as in the past, with age, life’s priorities and responsibilities being major reasons for the apparent slow down. But me and the missus would never miss her shows here wherever possible. For a live event, I was surprised the show did not start on time, or perhaps the eight minutes lag was for commercial reasons only known to the watching audience at home. 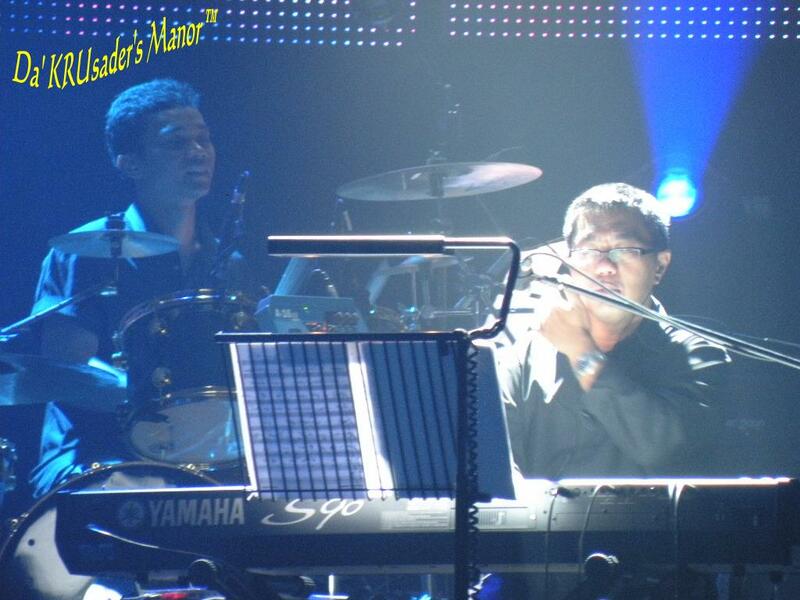 But the delay was very much forgiven when the lights in the arena dimmed and the sessionists began playing their respective instruments to signal the start of the concert. I had expected M. Nasir to kick off the concert but true to the old adage of ladies going first, the onus to start the ball rolling fell on the shoulders of Dato’ Siti herself and she did not disappoint, surprising the audience by appearing amongst the dancers instead of from the raised platform on top of the stage. 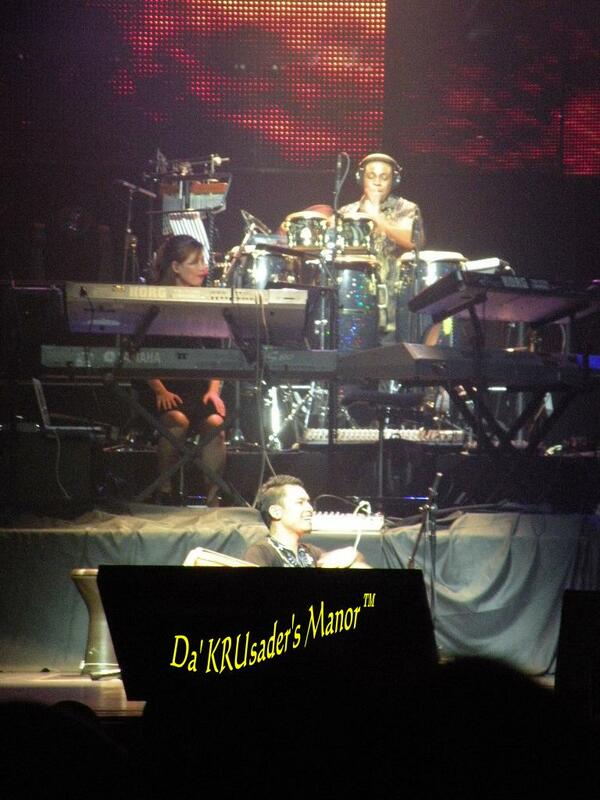 The silhouette that appeared from the platform, turned out to be one of the female dancers impersonating her. It was a gimmick that some had expected, since the introduction of “Nirmala” was apparently her recorded voice from the original track taken off her “Sanggar Mustika” album. I will not relate every single gimmick or what happened during each song per se, but during the first hour of a concert that had no intermission, the audience was brought back in time to her old hits like “Cindai” and to her more recent one, “Ku Percaya Ada Cinta“. Each song sung depicted her journey as a performing artiste for the last decade or so, with some telling stories of her own love life. 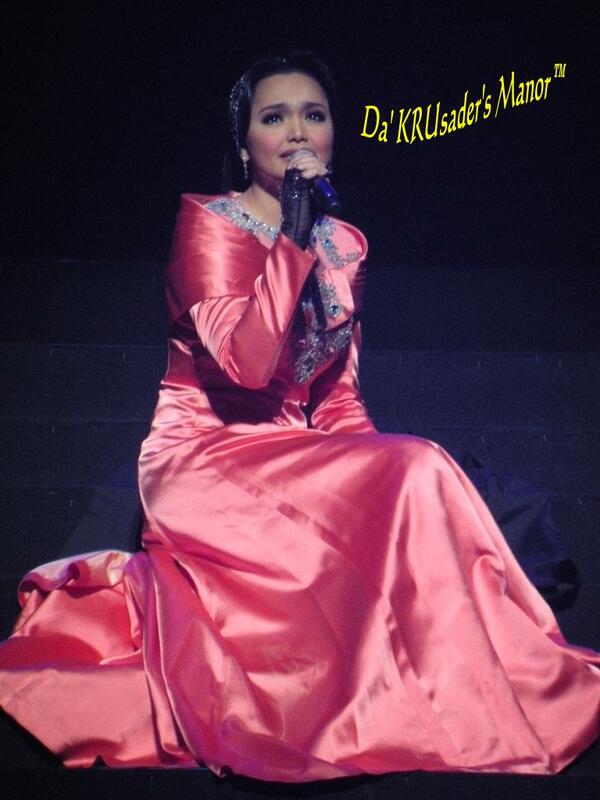 Of the ten songs she sung during her set, one of them “Ada Masa Mata“, which was composed by none other than M. Nasir himself, made its debut during the concert having never performed anywhere before this. 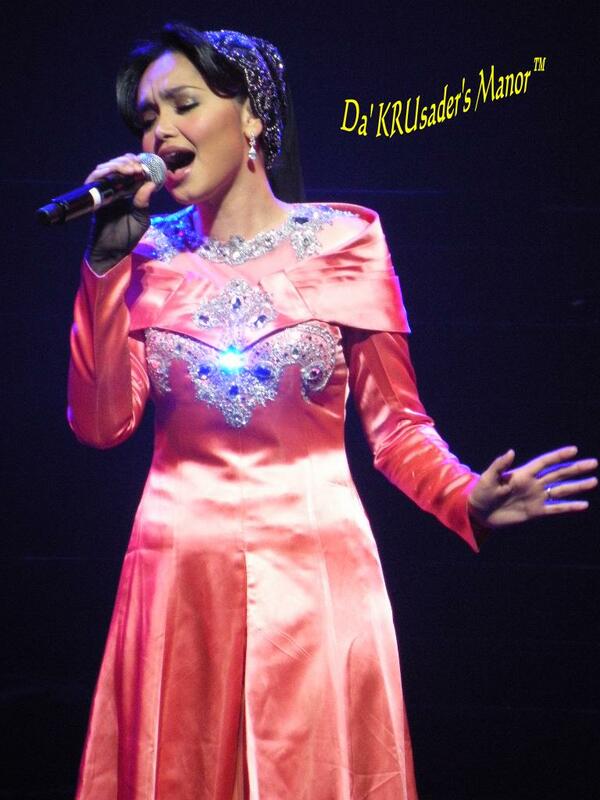 The song however, can be found in her “Lentera Timur” album (Thank you Azhan for correcting my earlier mistake. I stand corrected… 🙂). Certain songs were also given fresh injections, with “Ku Mahu” given a touch of salsa and “Ku Milikmu” synergising with Beyonce Knowles’ “Crazy In Love“, making it a dance-fest of sorts. I’ve never seen this legendary living diva danced and moved so much in past concerts but I guess experience has taught her a lot and she is one performer who continues to improve and not resting on her laurels. It could also mean I’ve been detached from watching her perform for a considerable amount of time to be surprised with this aspect of her performance. Speaking of her experience being an artiste for half her life thus far, she seemed more relaxed and at ease bantering with the audience, though it has to be said at times one could detect that she was feeling a bit nervous performing in a concert of this magnitude. Even if at times the apparent nervousness betrayed her from the sound of her voice, she was still able to poke fun at herself and her critics for paying too much attention on her dressing and what she does on stage that could start tongues wagging. Though she has 14 years of experience (15 if you include her formative years during Bintang HMI in 1995 which she won) under her belt, she still admitted to feeling nervous before stepping on stage, or whether she would get her dance steps right or otherwise, or if she could hit the high notes when it mattered. That’s the mark of an artiste who continues to strive for perfection and concerned in giving only the best to the paying and watching audience. However, I just feel that this was a concert that for once, Dato’ Siti had to play second fiddle to the music maestro on both sides of the Causeway. How else could we explain the numerous calls for “Nasir” to appear, halfway through her set??? No matter if he is now a Malaysian citizen, Singaporean fans still regard him as one of our own and a shining example to follow for artistes and musicians alike who want to make a name for themselves across the Causeway. And when she started to sing “Kesuma Jiwa” from the 60s movie “Hang Tuah“, it was the cue for his arrival, as rapturous applause greeted the arrival of “the moustachioed one”, who appeared via the raised platform at the top of the stage. Singing “Ghazal Untuk Rabiah“, “Suatu Masa“, “Mawarku” & “Lagu Gembira“, the magic of this concert truly came to life when both were on stage. Dato’ Siti did a stellar job at warming up the audience for what to expect during this concert cos when M. Nasir took centrestage, one could feel the energy from the audience already bursting at the seams. 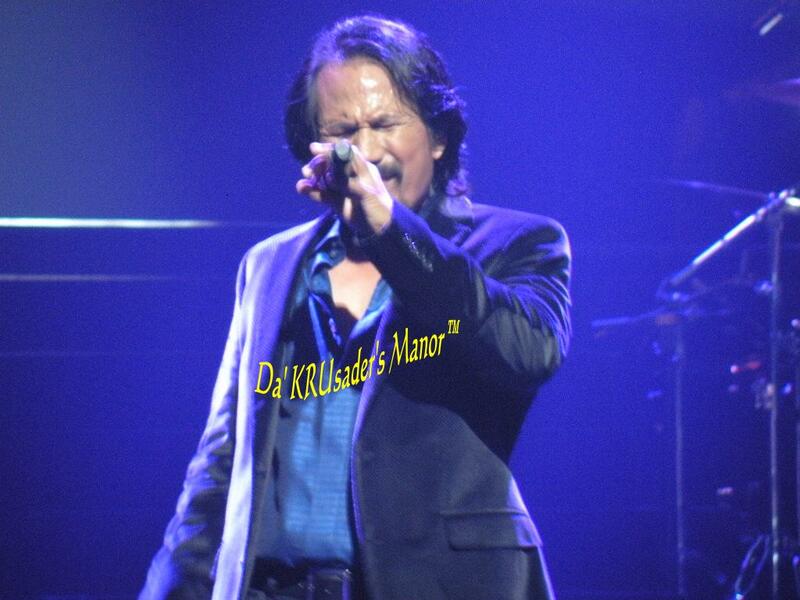 We were definitely not disappointed as he began taking us back in time with hits like “Hati Emas“, and “Sahabat Gua“. He even managed to tug at the heartstrings in memory of his late wife, when he sang his haunting composition “Srikandi Cintaku“, which was made famous by the group Bloodshed. Another one that had me singing along was “Milik Siapakah Gadis Ini“, a massive hit back in the 80s when I was still a primary school kid. This was another one of his compositions which he said he has never performed before and hoped to do justice singing it. I thought his version and the late singer’s were special in their own right. 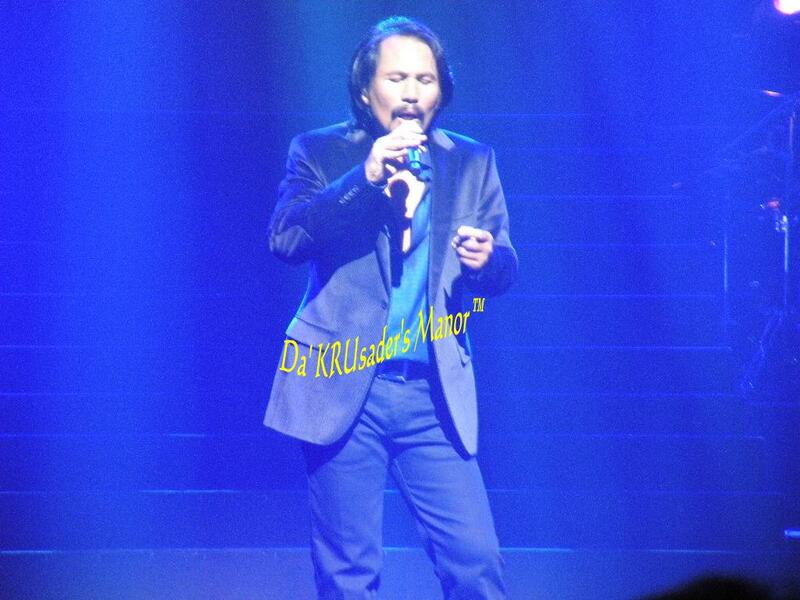 The beauty and essence of the song still remained intact, even if he did not stretch his vocals like Allahyarham Sudirman did. And what is a concert featuring M. Nasir without “Mentera Semerah Padi“, “Raikan Cinta” and “Ada” to totally rip the roof off the arena??? He practically had the audience in his grasp right from the word “Go”. If there was a mosh pit or had I been sitting right at the back, I would have stood up and danced all night. Yes, his music is indeed infectious, not that we don’t know already. The best part about his set was that, unlike Dato’ Siti‘s, his was a one-man show with no back-up dancers to add colour to his performances nor taking short breaks for costume changes. His music, showmanship and energy were truly remarkable and this was helped by a strong cast of sessionists led by renowned music directors Aubrey Suwito for Siti‘s set and Aznan Alias for his. Familiar faces like Steve Thornton on percussions and Ujang of Exists fame on drums were also on hand to lend the concert a touch of elegance with their musicianship. By the time M. Nasir finished his set of ten songs, his jacket was off and one could see clearly how wet his shirt was due to perspiration, not helped by the warm glare of the stage lights. So it was only apt that he went back for a change of clothing and both singers appeared on stage again via the raised platform to sing their duet “Bagaikan Sakti“, which was also the title of this concert. 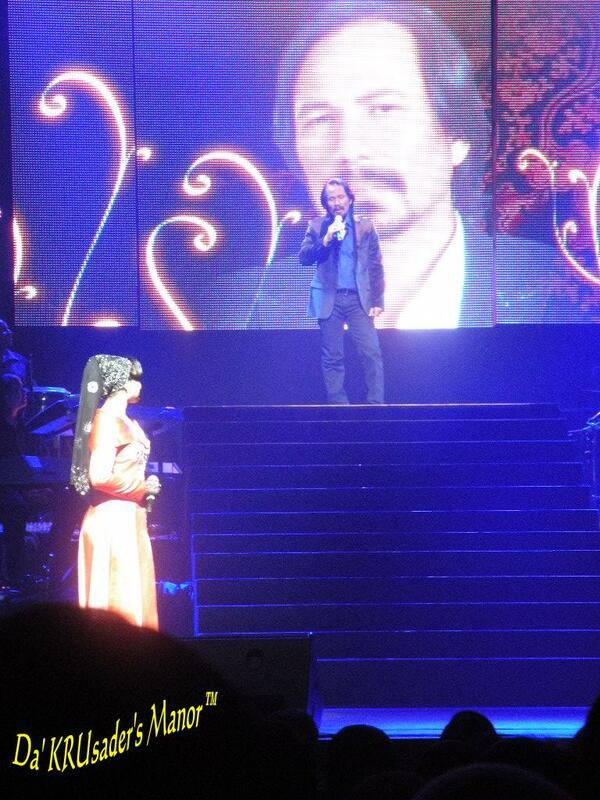 I thought that singing that song proved to be the final song but apparently the second set for both singers featured two more songs with them performing another one of his old hit “Dua Insan“, a duet made famous by him and Yunizar Hussein almost three decades ago, and “Hanya Semalam“, a song composed by him and lyrics written by Siti herself specially for this concert. Watching them singing seven songs together split into two sets, I’m sure for those who watched, they would agree that both entertainers definitely have this spark and chemistry to be duet partners that would leave a lasting legacy like the likes of Anita Sarawak & Ismail Haron or Ramli Sarip and Dato’ Khatijah Ibrahim amongst others. Even M. Nasir himself admitted that for decades he has been searching for the perfect duet partner and for the first time that night, he claimed that he had finally found her. And who are we to disagree cos they were both simply spell-binding and immaculate in delivery, hitting the high notes with such nonchalant ease, bantering and poking fun at each other. It was no surprise that when the three-hour concert ended, they had the majority of the arena according them the due respect that they rightfully deserved by giving them the standing ovation. Due to the fact that Dato’ Siti‘s last major concert at the Esplanade in March 2008 did not have any autograph-signing session and based on the same thing occuring after Anuar Zain‘s concert in November the same year, I had anticipated the same thing would be happening again. But I was surprised when I heard that there was to be one held and that we had to buy the official merchandise being sold outside the theatre to have any chance of meeting the two concert protagonists. I was already in the queue when news of the session was being broadcasted by word of mouth as I wanted to buy her two latest offerings “Tahajjud Cinta” and “CTKD“, her duet album with beleaguered Indonesian diva, Kris Dayanti. After purchasing, the missus and I duly joined the queue hoping to say “Hi” to someone we have not met up close and talked to for almost five years now. The wait to meet them felt long even though the security personnel were waving away the fans quickly so as to allow more to get their opportunity. Halfway through, we were told not to take photographs with them as it was slowing down the queue. What was supposed to be a 45 minutes affair, turned out to be only about half of that. It was just our rotten luck that the session stopped just as we were about to greet her, as M. Nasir had left by then (word has it he left cos he got bored that he had no official merchandise to sign on, as those that were being sold were Dato’ Siti‘s), but not before he stopped to take a last photo with yours truly. But I have to highlight why Dato’ Siti is so endearing to her legion of fans to this date, is because she does go the extra mile to please them, no matter how minor it may sound. Yes, the session might have stopped abruptly, but she personally told the security personnel to allow her to go up to them to apologise for not staying longer than she would have liked to and so that she could shake hands with as many as possible, and I believe we were not disappointed. I certainly did not, as she acknowledged me with the familiar cheeky smile she used to greet me whenever we met in the past, and that look never changed even though it was our first meeting in a long while, with both our marital statuses changed. Though our short exchange was just the customary pleasantries, the warmth of acquaintanceship was still there. It’s rare to find someone who’s high up on the pedestal as Malaysia‘s number one singer, having millions of fans in the region, but still remembering you even after so long. It was definitely the icing of my 31st birthday even though it came a day late. Some established artistes, and I could name a few, could learn a thing or two with regards to being sincere with their fans. And so, Konsert Bagaikan Sakti had left an indelible mark in the memories of those who had been fortunate enough to bear witness to such a landmark event. It definitely has set a high standard for future concerts to come in 2010 and I for one felt that three hours were still not enough. It is never enough when it comes to the likes of M. Nasir and Dato’ Siti Nurhaliza. Even without much fanfare or aggressive promotions by the organisers, the tickets were all sold out in less than three weeks. That shows that with reputable brand names like them, you can be sure that no amount of compromise were to be expected as you are guaranteed value-for-money in quality with their performances. Every single one who watched it live or from the comfort of their homes would agree that that was simply breathtaking and definitely a good start to the year. 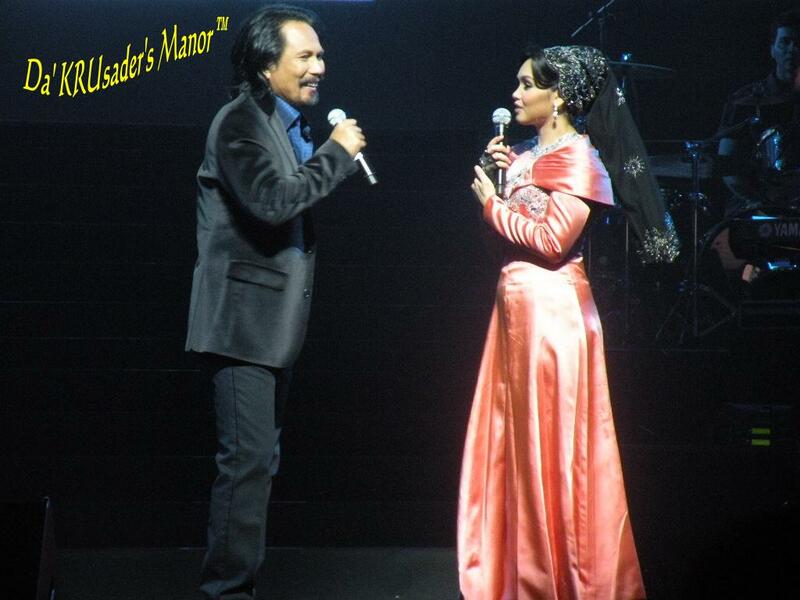 Take a bow Beyond Events, M. Nasir & Dato’ Siti Nurhaliza. You definitely have set the benchmark for 2010!!! 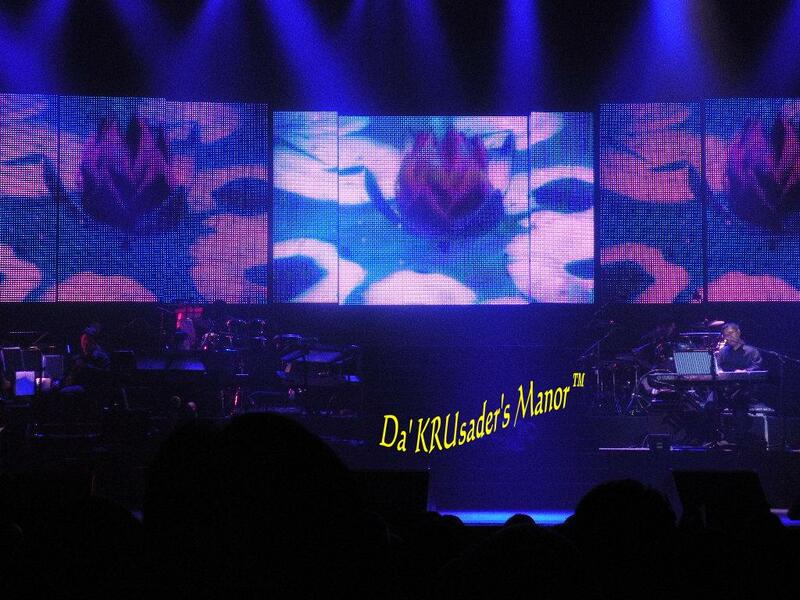 Blogger says: Of the ten songs she sung during her set, one of them “Ada Masa Mata“, which was composed by none other than M. Nasir himself, made its debut during the concert having never performed or recorded anywhere before this. Comment: Ada Masa Mata is from Siti’s Lentera Timur (Track No 4). Overall, I am very happy with the concert. Except, I think Siti and M. Nasir should have rehearsed more on what to converse on stage. I mean, they were like waiting for one another to say something. One good example was when M. Nasir was saying duet and Siti thought he was saying duit. Performance wise, I prefer Siti’s ones. To me, at certain point, M. Nasir’s ones got a bit boring when he tended to modify his songs too much. I am really impressed with Siti’s talent in composing the lyric for Hanya Semalam. I know she can write well, but the lyric for Hanya Semalam proves that she is quite a lyric writer. Thank you once again Azhan… Much appreciated!!! I am very disappointed that I couldn’t get the ticket. I was very happy that ASTRO shows live and paying only RM10. The best part is that ASTRO repeat the live telecast for 3 to 4 times a day till 10 Jan. The concert is fantastic. 2 thumbs up for M Nasir and Dato Siti. Sedey giler..knapa takde promotion besar-besaran diadakan di singapura sendiri..di media tv or radio…sbagai peminat sedey kerana tidak dapat utk menyaksikan konsert ini…Pihak2 berkenaan seharusnye membuat publisiti yg berkesan supaya ia sampai kepada semua golongan peminat..
Hi. I see that you don’t update your website too often. I know that writing content is boring and time consuming.